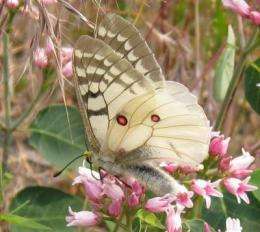 (PhysOrg.com) -- California butterflies are reeling from a one-two punch of climate change and land development, says an unprecedented analysis led by UC Davis butterfly expert Arthur Shapiro. The new analysis, scheduled to be published online this week in the journal Proceedings of the National Academy of Sciences, gives insights on how a major and much-studied group of organisms is reacting to the Earth's warming climate. "Butterflies are not only charismatic to the public, but also widely used as indicators of the health of the environment worldwide," said Shapiro, a professor of evolution and ecology. "We found many lowland species are being hit hard by the combination of warmer temperatures and habitat loss." The results are drawn from Shapiro's 35-year database of butterfly observations made twice monthly at 10 sites in north-central California from sea level to tree line. The Shapiro butterfly database is unique in science for its combination of attributes: one observer (which reduces errors), very long-term, multiple sites surveyed often, a large number of species (more than 150), and attendant climatological data. Shapiro's co-authors include three other UC Davis researchers and two former Shapiro graduate students, including lead analyst Matthew Forister, now an assistant professor of biology at the University of Nevada, Reno. • Butterfly diversity (the number of different species present) is falling fast at all the sites near sea level. It is declining more slowly or holding roughly constant in the mountains, except at tree line. • At tree line, butterfly diversity is actually going up, as lower-elevation species react to the warming climate by moving upslope to higher, cooler elevations. • Diversity among high-elevation butterflies is beginning to fall as temperatures become uncomfortably warm for them and, Shapiro says, "There is nowhere to go except heaven." Using a battery of statistical approaches, Shapiro and his colleagues concluded that climate change alone cannot account in full for the deteriorating low-elevation numbers. Land-use data show that the butterfly losses have been greatest where habitat has been converted from rural to urban and suburban types. He added that one of the most surprising findings was that ruderal (“weedy”) butterfly species that breed on “weedy” plants in disturbed habitats and are highly mobile are actually declining faster than “non-weedy” species -- those that specialize in one habitat type. This is especially true in the mountains, where such species do not persist over winter but must recolonize every year from lower altitudes. As their numbers drop in the valleys, fewer are available to disperse uphill, and the rate of colonization drops. “Butterfly folks generally consider these ruderal species to be ‘junk species,’ sort of the way bird watchers think of pigeons and starlings,” said Shapiro. “So it came as a shock to discover that they were being hit even harder than the species that conservationists are used to thinking about. More information: The study, "Compounded effects of climate change and habitat alteration shift patterns of butterfly diversity," will be online at www.pnas.org . It was funded by the National Science Foundation. The Shapiro database is online at butterfly.ucdavis.edu . It includes butterfly observations and study site maps, together with climate data from nearby weather stations, descriptions of study sites and habitats, and numerous photos. The 10 survey sites lie along Interstate 80 and range from low-lying Suisun Marsh on San Francisco Bay to 9,103-foot-high Castle Peak near Donner Summit. The database was made public in 2007, also with funding from the National Science Foundation. Climate change; the butterflies will evolve, as they always have done, to deal with the change, but the 800 lb gorilla = too many people leading to habitat loss will never be compensated for. So, how do we, as a society, fix the problem? Adaptation takes time. If the climate changes to fast then the species will disappear (as the study already shows). You can't 'reappear' a species once it is gone. Change only is possible as long as the species hangs around. So saying that 'the butterfly will adapt' is a bit simplistic.